The History Of Oregano | From Cooking to Medicinal to Rituals and Superstition! Like a lot of herbs and spices, the history of oregano dates back thousands of years. In Greek and Roman times, it was widely regarded as the main herb in the health and medicinal fraternity. Though it's unclear what species of oregano the ancient Greeks and Romans grew. Read more about the plant. But even before the Greeks discovered the benefits of oregano, it is recorded that it was being used by the Assyrians in 3000BC! 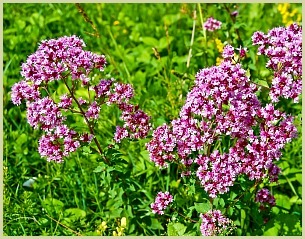 The name oregano actually comes from the Greek "oros" meaning mountain and "ganos" meaning joy, which literally translates nicely as “joy of the mountains”. This is quite apt, as it was originally native to the mountainsides of Greece, Italy and other Mediterranean countries. The antidote to poison claim came about when the Greek philosopher Aristotle noticed that after tortoises had just eaten a snake they would immediately eat the leaves of the oregano plant. However this is one treatment I don't recommended you try! Better to go to hospital for snake bites. Read more about the oil. As well as being used for medicine and flavouring, it was used in ritual and traditional ceremonies. And in both Roman and Ancient Greek wedding ceremonies, the bride and groom were crowned with oregano laurels. The tea ritual is a nice one, and even today people drink it for its many health benefits. See my recipe for oregano tea. Saffron History - From Queen Cleopatra to Alexander the Great!